Dr. Pointer currently treats children, adolescent, and young to middle age adult patients. She treats a variety of mental illnesses such as ADHD, Mood Disorders, Anxiety and Psychotic Disorders. 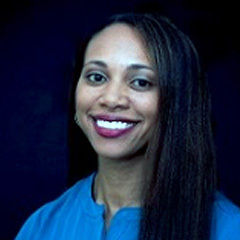 Dr. Pointer has worked extensively with patients from a variety of cultural and socioeconomic backgrounds. She has worked at several mental healthcare facilities throughout the Atlanta metro area. She also has experience treating patients in Pennsylvania and Georgia using telemedicine. Telemedicine has afforded her the opportunity to provide care to areas that otherwise would have a shortage of mental health services. She uses a combination of medications and psychotherapy in treating her patients. She uses a holistic approach to treatment and she enjoys tailoring treatment plans to each individual patient. She educates and empowers her patients to become their best selves. Dr. Melanie Johnson Pointer completed her undergraduate studies and medical school training at Wake Forest University in Winston-Salem, NC. Upon graduation from medical school, she matriculated to The University of Virginia in Charlottesville, VA, where she completed her internship in psychiatry. Dr. Pointer is a member of the American Psychiatric Association, The American Academy of Child and Adolescent Psychiatry and The Georgia Psychiatric Physicians Association.